Louis Thomas Hardin (a.k.a. Moondog, a.k.a. The viking of 6th Avenue) was born in Kansas in 1916 and was blinded in an accidental explosion when he was 16 years old. He attended various music schools for the blind but developed his own composing skill. Hardin moved to New York in 1942 where his original musicianship was recognised by many celebrated musicians, both from the classical and jazz fields. He wrote poetry and set many to music. He lived as a street musician between 1942 to 1972 wearing a viking cloak and a horned helmet which earned him the moniker “the viking of 6th Avenue.” Hardin adopted the Moondog alias in 1947 in honour of a dog who used at the moon. Hardin emigrated to Germany in 1974 where he lived for the remainder of his life. He died on 8th September 1999. Originally released by Prestige Records in 1957, this LP has long been one I have been looking for. I suspected that this record was incredibly rare, but there are over fifty copies listed on http://www.popsike.com and two appeared on Ebay in the same week in May 2015. Both these copies’ front covers were considerably yellowed but they still sold for over $250 each. Needless to say, I didn’t win either of them! 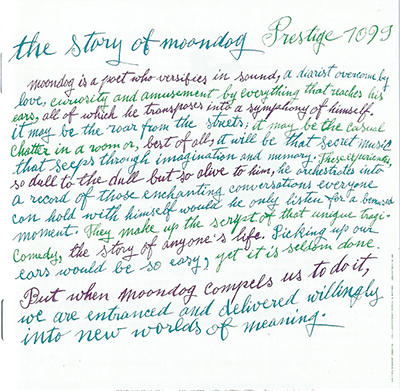 The original record was recorded in 1956-7 and Reid Miles, Prestige record’s art director approached Andy Warhol to ask his mother Julia to write out Stewart Preston’s eulogy to Moondog in her characteristic calligraphic style. According to Paul Maréchal in “Andy Warhol: The Complete Commissioned Record Covers, 1949-1987” she wrote out the text but – as was her wont – the lines tended to slope up to right so Andy cut them into strips to fit onto the cover. The text was credited to Preston and the calligraphy to Andy Worhol’s mother – with Warhol wrongly spelt. Design was credited to Reid Miles and the credits were place vertically at lower right on the front cover. “The Story of Moondog” has been re-issued several times. First in 2009 on the Honest John Records Label with an entirely different cover and then in 2010 on the 4 Men With Beards label with the original cover but without the Prestige 7099 on the front cover and with the credits to Stewart Preston and Andy Worhol ‘s [sic] mother and Reid Miles removed. The latest re-release in 2011 was in a numbered limited edition box set by DOXY Records with the same cover as the 4 Men With Beards release. 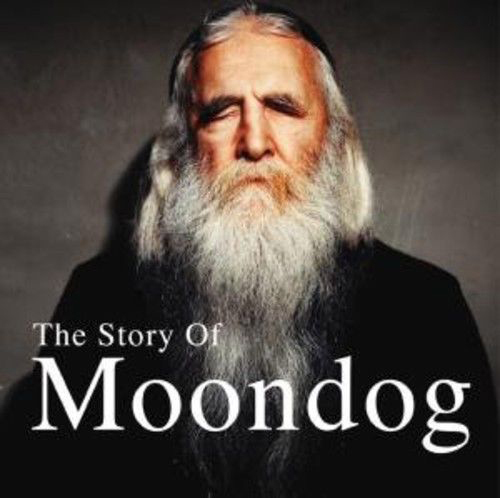 The 2009 re-issue of Moondog’s “the Story of Moondog”. The album was re-released in a remastered version on CD in 2014 in Japan, once again on the Prestige Label. The Japanese seem to be particularly good at doing the re-issue job properly as evidenced by their CDs in mini LP sleeves. So the CD booklet recreates the original LP cover art – both front an rear covers exactly. The CD cost one-tenth of what one of the copies recently sold on Ebay cost! 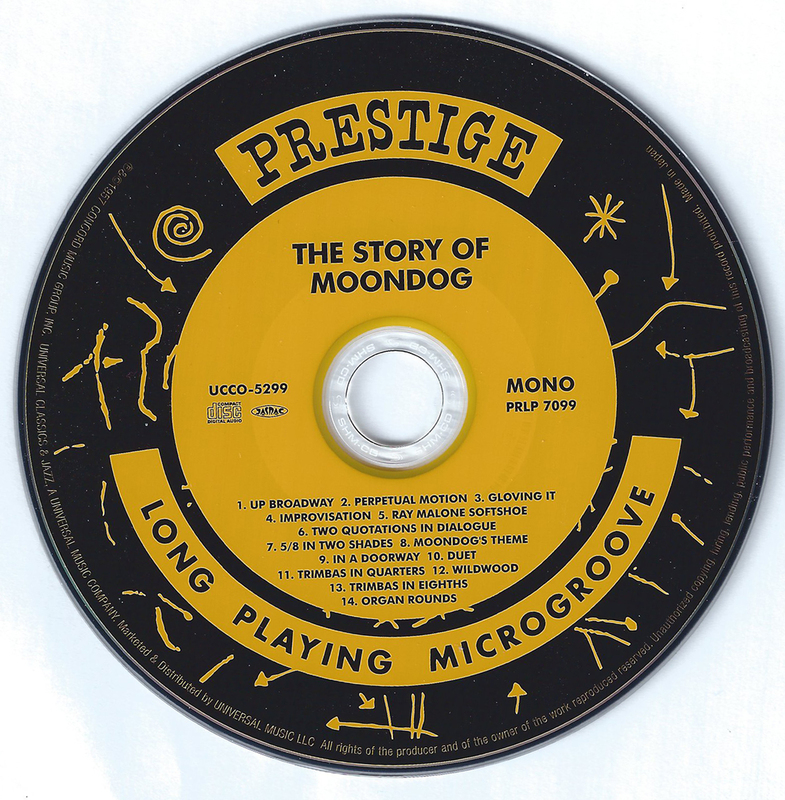 “The Story of Moondog” CD from 2014. Note the “Prestige 7099” at top right and the minute credits along the lower right hand edge. The CD has a poster showing the original LP rear cover and the CD itself is a copy of the LP’s original label, but with a new catalogue number. The CD with a recreated Prestige record label. I shall have to make do with the CD until a decent copy of the original LP turns up.